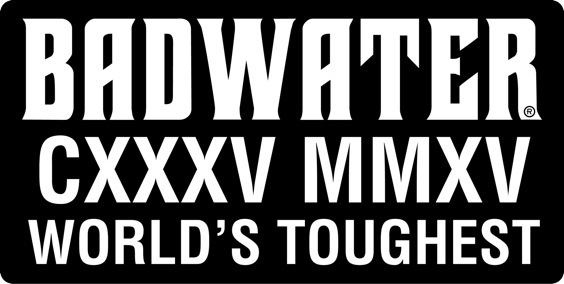 Death Valley, CA: On July 28-30, AdventureCORPS presents its legendary Nutrimatix BADWATER® 135. Now in its 38th year, the world-renowned event pits up to 100 of the world’s toughest athletes against one another and the elements. 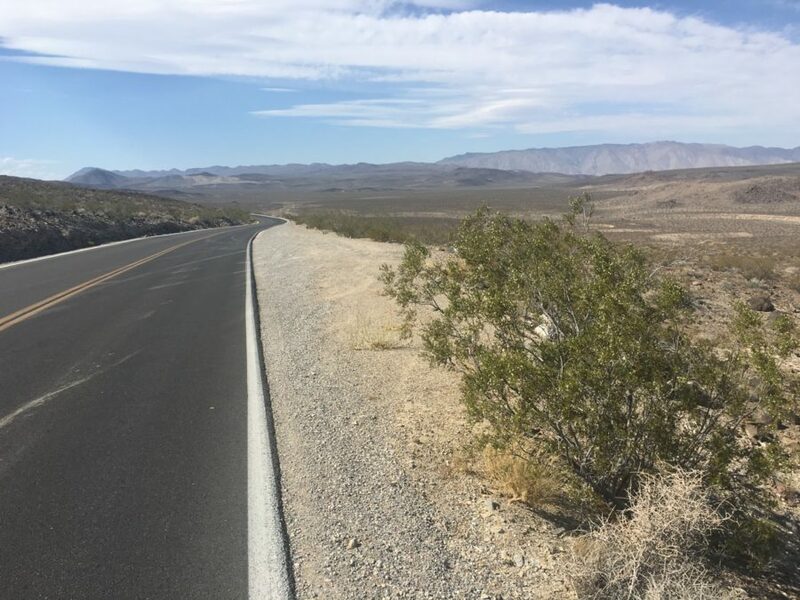 In scorching temperatures and at altitudes as high as 8,300 feet, runners, triathletes, adventure racers, and mountaineers from 24 countries and 22 American states face off in a grueling 135-mile trek non-stop from Death Valley to Mt. Whitney, CA. Widely recognized as “the world’s toughest foot race, “ it is the most demanding and extreme running race on the planet. 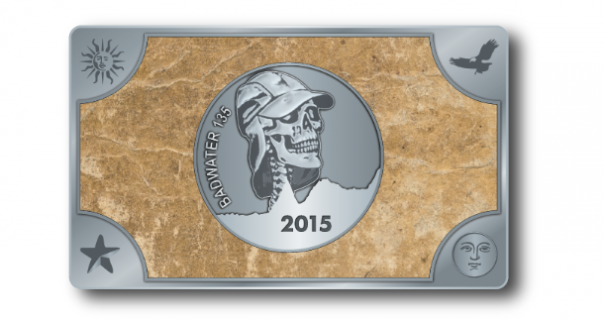 A true “challenge of the champions,” the 2015 Nutrimatix Badwater 135 features 59 Badwater veterans and 38 rookies: die hard “ultra-runners” of every speed and ability, as well a athletes who have the necessary running credentials, but are primarily known for their exploits as adventure racers, mountaineers, triathletes, or in other extreme pursuits. With the most international field in race history, the athletes represent twenty-four countries by citizenship or residence: Argentina, Australia, Brazil, Canada, Colombia, Czech Republic, France, Germany, Guatemala, Ireland, Japan, Jordan, Mexico, Netherlands, New Zealand, Philippines, Poland, Serbia, Singapore, Spain, Sweden, Switzerland, United Kingdom, and United States of America (with 22 different American states represented). The men’s course record is held by Valmir Nunez of Brazil with a time of 22:51:29 set in 2007, while the women’s course record of 26:16:12 was set in 2010 by Jamie Donaldson of Littleton, CO. 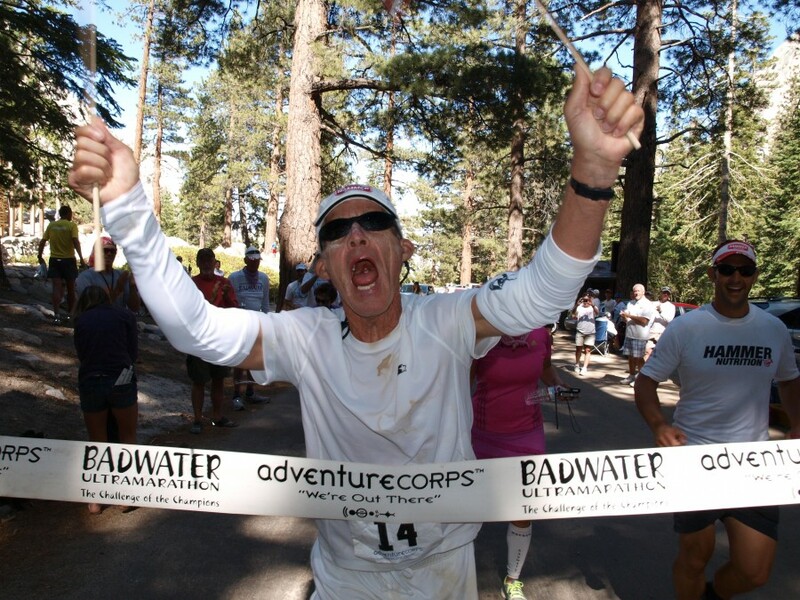 It is expected that the winner of the 2015 Nutrimatix Badwater 135 will finish in under 24 hours. The average finishing time is approximately 40 hours, while the overall time limit is 48 hours. 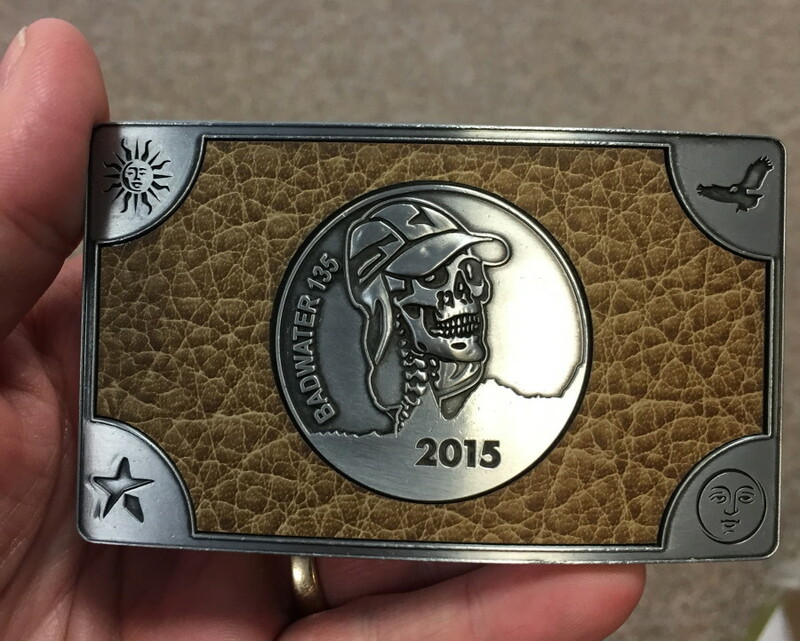 For those who finish in less than forty-eight hours, their reward is the coveted Badwater 135 belt buckle, pictured below. There is no prize money. The 2015 race field is particularly competitive. Veteran contenders include 2007 champion and course record holder Valmir Nunez of Brazil, 2014 champion Harvey Lewis of Ohio, 2011 men’s champion Oswaldo Lopez of Madera, CA (Mexico citizenship), two-time men’s runner-up Grant Maughan of Australia, and other notable contenders. The women’s field, with 29 entrants, includes 13 rookies and 16 veterans. Contenders include the 2014 women’s champion, Alyson Venti, 33, of New York, NY and Pam Reed, 54, of Jackson, WY, the 2002 and 2003 overall champion who also won the women’s field in 2005 and was the second female in 2012, 2013, and 2014. This year, over 50 of the race entrants are competing on behalf of a charity of their choice. 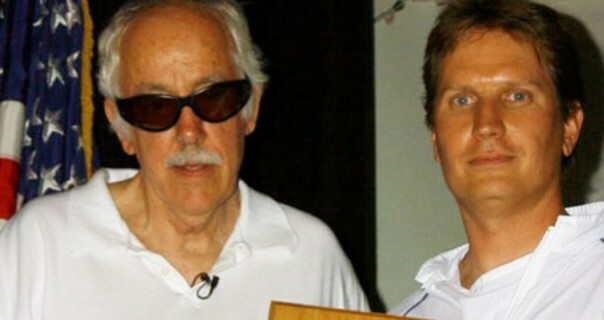 Some of those include Be Change, Caring House Project Foundation, Challenged Athletes Foundation, Death Valley Natural History Association, Hope So Bright, Operation Eyesight Universal, Running Works, The Herren Project, and others. 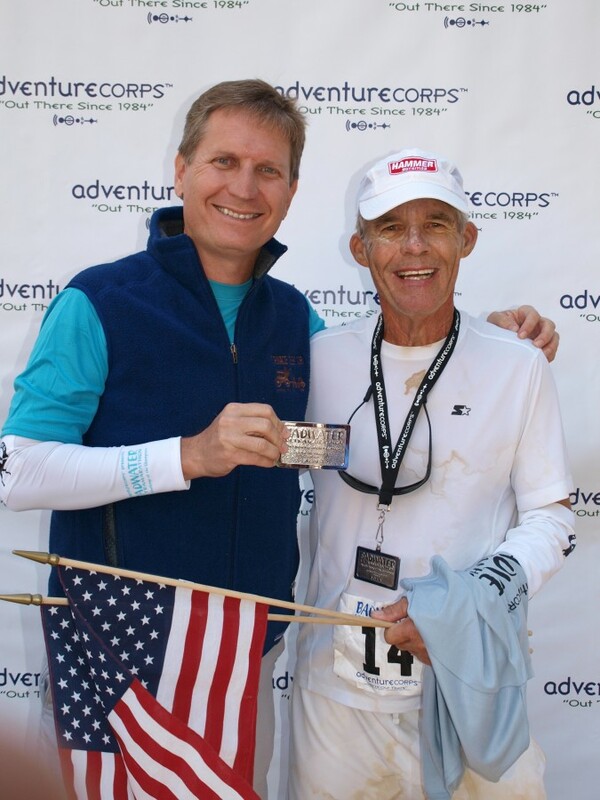 Oak Park, CA-based AdventureCORPS®, Inc. is an athlete-run firm producing and promoting ultra-endurance sports events and the world’s toughest brand, BADWATER®. 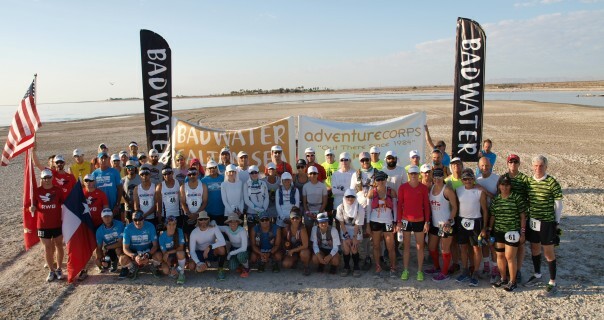 AdventureCORPS’ world-class events for athlete-adventurers include epic races such as the Badwater® 135, BADWATER® Salton Sea, BADWATER® Cape Fear, and Silver State 508™, and other events. AdventureCORPS products include Badwater® Apparel, Badwater® Skin Care, Badwater® Gear, as well as other great lifestyle items and services. 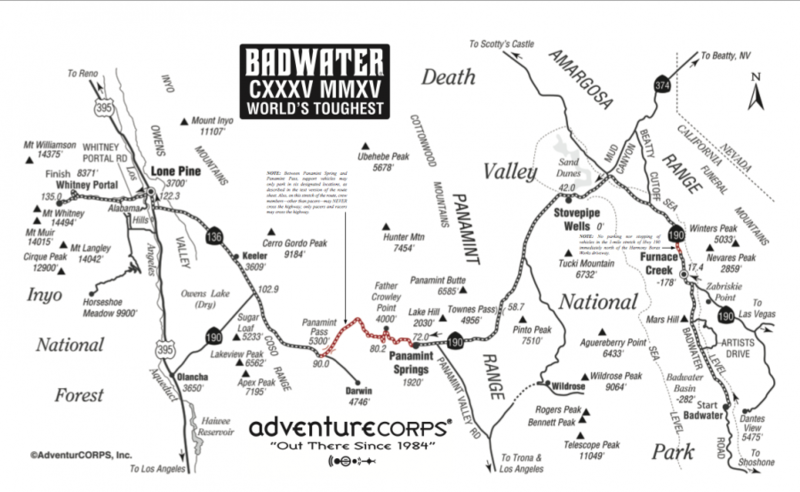 Founded in 1984 by Chris Kostman, this group effort is dedicated to exploring the inner and outer universes, seeking adventure, energy, and insight both in daily life and “out there.” More info: www.adventurecorps.com and www.badwater.com. 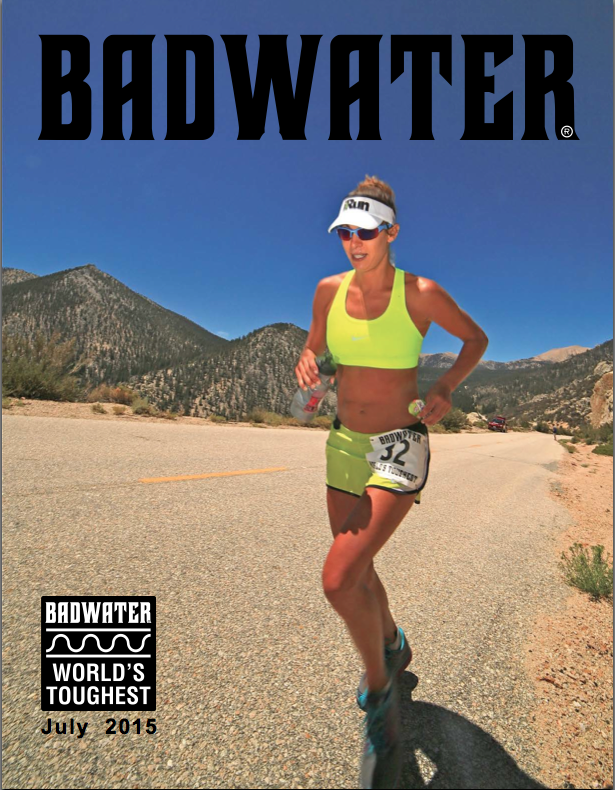 Badwater® is a registered trademark owned by AdventureCORPS, Inc.
We are pleased to announce that the July 2015 issue of BADWATER® Magazine is available as a 10MB PDF download now. It’s 60 pages, full-color, and the biggest and best edition yet of our magazine that celebrates the BADWATER way of life! Special thanks to Kevin Fung for the design, Bob Corman for the printing, and all the great photographers, writers, and athletes who make the whole thing come to life and look awesome! 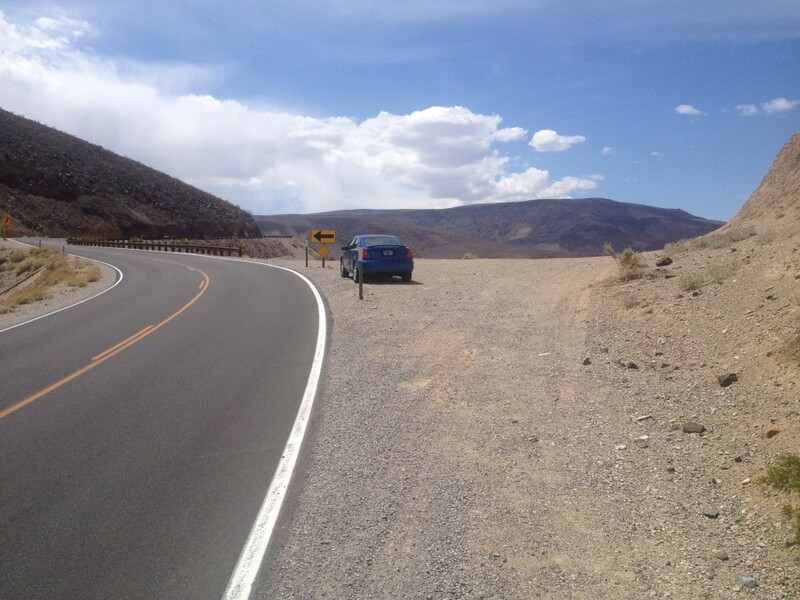 On the Father Crowley / Panamint Pass climb (a 12.2-mile stretch from Time Station 3 at Panamint Springs Resort at Mile 72.7 to “Panamint Pass” at Mile 84.9), support vehicles may only stop at eight designated locations along the route. These will be identified in the route book and with signage along the roadway. 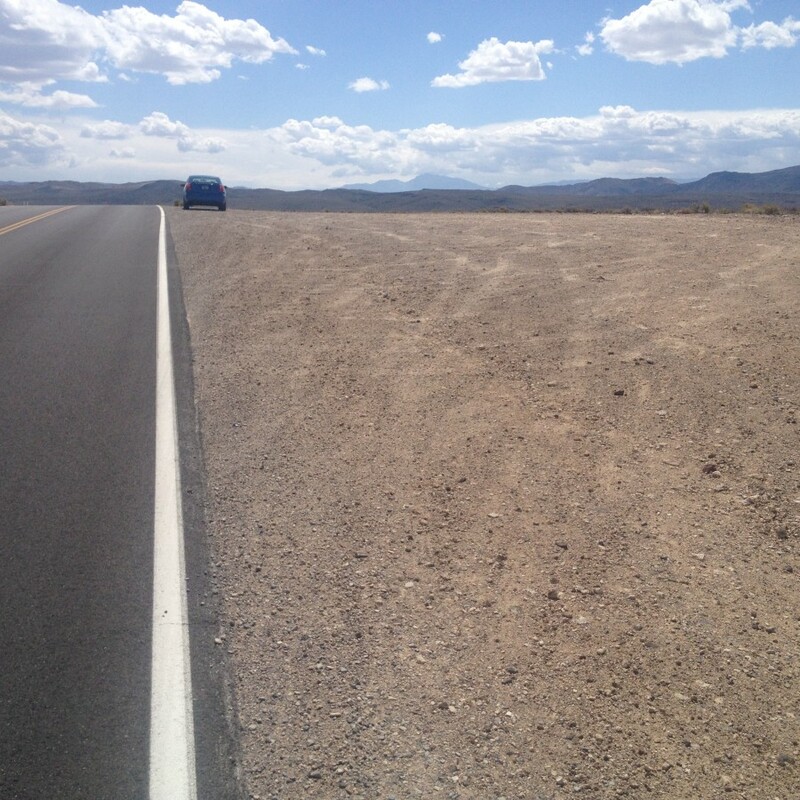 They are located 1.8, 3.4, 4.7, 5.3, 7.9, 8.7, 10.5, and 12.2 miles beyond Panamint Springs Resort. Except in a legitimate emergency situation, stopping at any other location along this stretch of roadway, even momentarily, will result in the immediate disqualification of the racer associated with the stopped crew. In addition to Badwater race staff, this will also be monitored by National Park Service staff who have the authority to disqualify racers. The photos depict the eight designated parking zones. 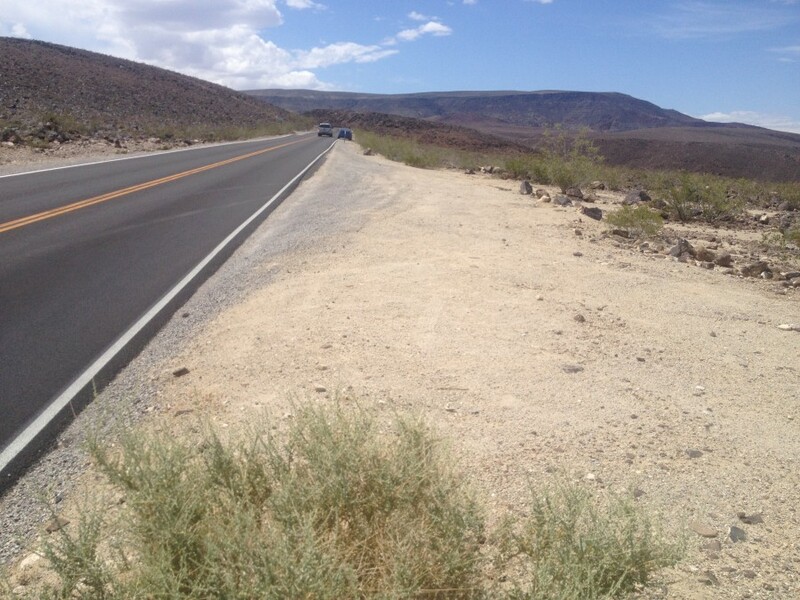 Furthermore, crew members, other than pacers, may never cross the roadway during the entire Father Crowley / Panamint Pass climb (a 12.2-mile stretch from Time Station 3 at Panamint Springs Resort at Mile 72.7 to “Panamint Pass” at Mile 84.9). Also, each racer, or racer’s pacer, is strongly encouraged to carry a walkie-talkie for communicating with his or her support crew during this 12.2-mile stretch of the race route. In addition to Badwater race staff, this will also be monitored by National Park Service staff who have the authority to disqualify racers. 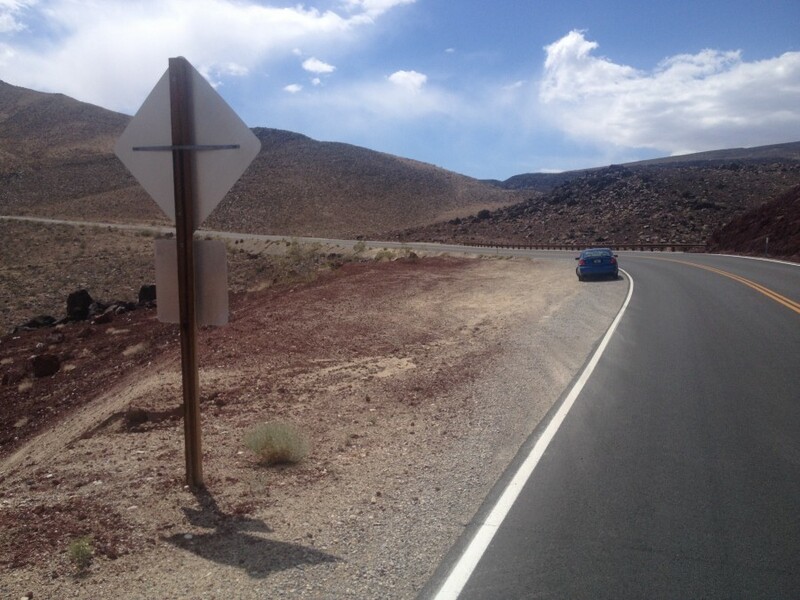 Parking Zone #5: Located at Mile 80.6, or 7.9 miles beyond Panamint Springs Resort. “Parking Allowed in parking lot at Father Crowley’s viewpoint parking lot.” NOTE: Please no sleeping on the ground in parking spaces! 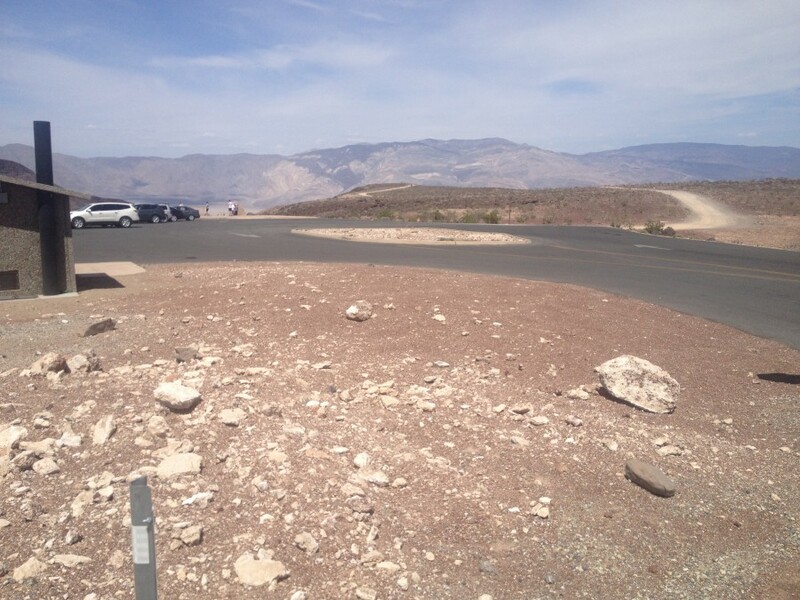 Parking Zone #6 (new for 2016): Located at Mile 81.4, or 8.7 miles beyond Panamint Springs Resort. “Parking Allowed in elevated lot accessed via small driveway on right.” NOTE: This is the best place to view the Air Force jets which often “strafe” the runners during the race! 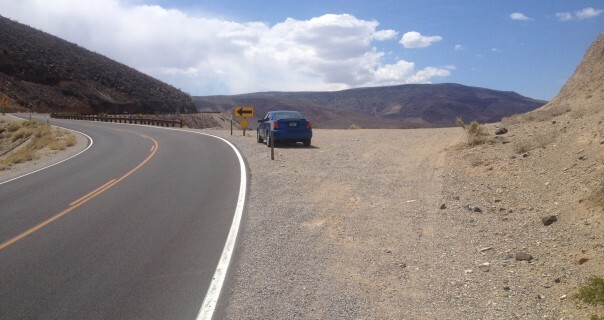 Parking Zone #8 at “Panamint Pass” (unsigned, but just before a 65 MPH speed limit sign): Located at Mile 84.9, or 12.2 miles beyond Panamint Springs Resort. “Parking Allowed on right in large gravel pullout.” Support vehicles may resume parking wherever it is safe and prudent to do so from here onwards. Time Station #4 at the Darwin turnoff is just 5.7 miles ahead. 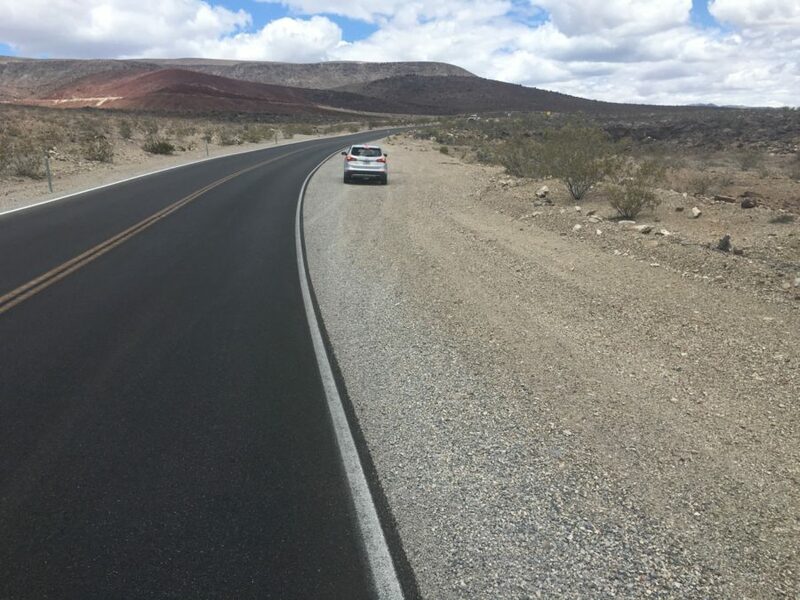 Additionally, support vehicles may not stop during the one-mile stretch which begins at Harmony Borax Works at Mile 19.1 (just after leaving Furnace Creek), while runners pass through the curvy “Harmony Curves” section of Hwy 190. 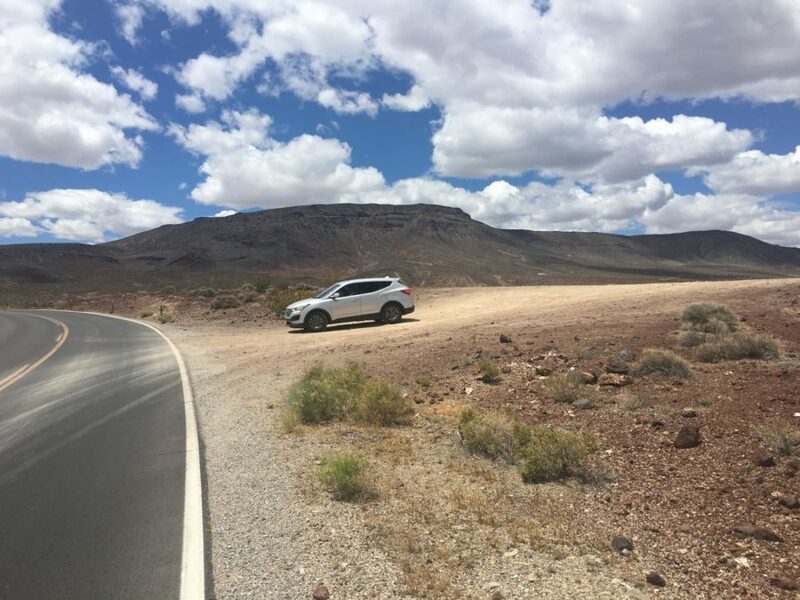 Each support vehicle should wait at Harmony Borax Works long enough to allow the runner to cover the next, mostly uphill mile, then drive ahead (no stopping nor slowing until Mile 20.1). For all the race route details, click here. 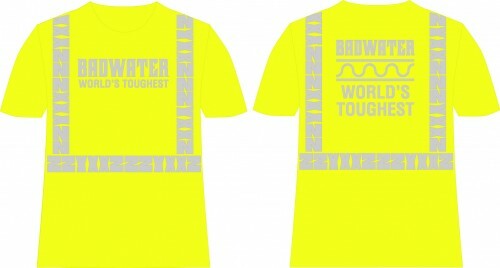 This 2015 BADWATER ZZYXXZ short-sleeve shirt meets OSHA Class 2 Reflectivity Requirements for use during the day (but not at night). The race rules continue to evolve in conjunction with new directives from, and negotiations with, the National Park Service. It is imperative that all racers and ALL crew members are studying the race rules regularly and very closely. The alternative is wearing certified OSHA Class 2 (in daytime) and Class 3 (at nighttime, or night + day) vests / jackets, such as those worn by highway workers, as in these two examples: Example 1 | Example 2. Please note that running-type reflective vests, such as those by Nathan Sports, do NOT meet OSHA Class 2 or Class 3 requirements. NOTE: Racers, and Pacers when allowed, may dress as they choose during daylight, and must wear 360 degree reflectivity (such as runner-type vests by Nathan Sports) and front and rear blinky lights at night. Racers and Pacers are not required to wear the specific OSHA Class 2 or OSHA Class 3 garments that are required for all crew members, though that level of high-contrast reflectivity and visibility is highly recommended for racers and pacers, too. In addition to the requisite reflective garments, all crew members, pacers, and racers must wear front and rear blinky lights whenever they are outside of a motor vehicle during nighttime. To pre-order the Class 2 short-sleeve shirts for during the day and Class 3 long-sleeve shirts for during the night (and day also, if desired), please click here. Orders must be submitted by June 15 so that ZZYXXZ can have your garments ready for you during Racer Check-In on July 27. 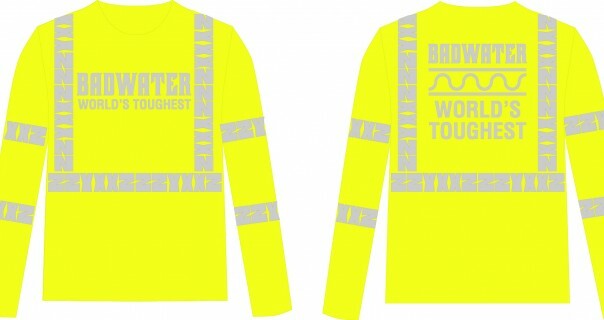 TO BE CLEAR: All crew members MUST wear these shirts, OR must wear certified OSHA Class 2 (in daytime) and Class 3 (at nighttime, or night AND day) vests / jackets, such as those worn by highway workers, as in the examples cited above. AT RACER CHECK-IN: All racers must display a minimum of two running-style reflective vests – which will be worn and utilized by the racer and pacer (if any) during nighttime periods of the race – and eight blinking red lights for racers, pacers, and crew members to wear at night. Also during Racer Check-In, all entrants must display one OSHA Class 2 reflectivity garment for each crew member to wear during the day, and one OSHA Class 3 reflectivity garment for each crew member to wear during the night. Thank you for your close attention to these matters and for quickly ordering the necessary garments to meet these rules. 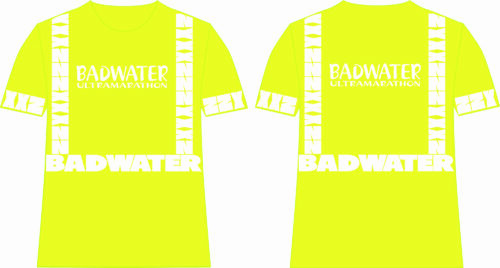 This 2015 BADWATER ZZYXXZ long-sleeve shirt meets OSHA Class 3 Reflectivity Requirements for use at night (and also during the day if preferred). This extra special 2016 / 2017 BADWATER ZZYXXZ short-sleeve shirt meets OSHA Class 3 Reflectivity Requirements for use at night (and also during the day). 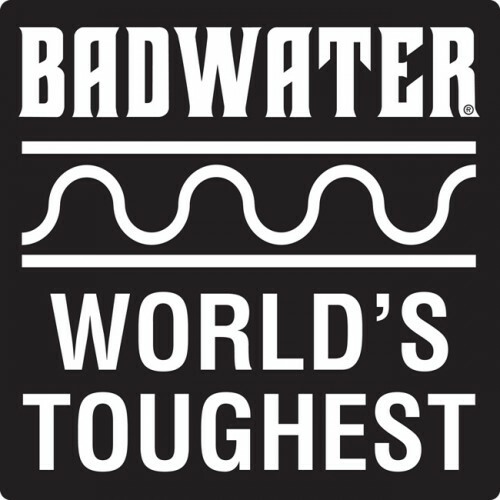 We are very excited to take the legendary Badwater 135 belt buckle – the holy grail of ultra running and endurance sports – in a new direction this year, and we found the perfect partners for doing so. First, in Lone Pine over the winter, we met Judyth Greenburgh of Darwin, CA (yes, Darwin, near mile 90 of the race route), who is a remarkable artist, fascinating woman, and a very legit desert denizen. After a visit to Darwin to get to know her, tour the area, and discuss the belt buckle art concept, she got to work on the design. She immediately “got” the concept, made it her own, and wildly exceeded our expectations. 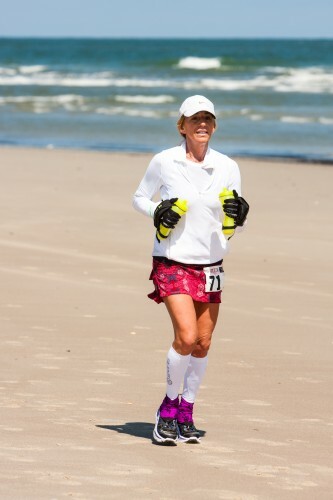 Next, we met Kim Ashworth at Badwater Cape Fear in March. A marathoner, she was there to support her sister, Kelly Facteau, who was competing in the race. Their father, George Lavallee, made a point of telling me that they ran an awards company based in Boston. When I met Kim, she confirmed that they do, indeed, produce their awards domestically, including for the Boston Marathon, and I was thrilled to learn that. (We’d been told my many other awards companies that nobody produced such items in the USA anymore.) 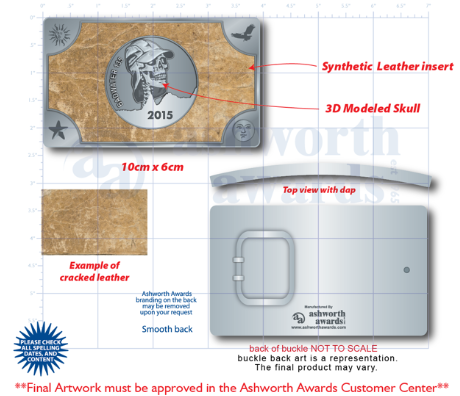 Thus Ashworth Awards became our new awards manufacturer, because we believe in supporting AmericaStrong companies. 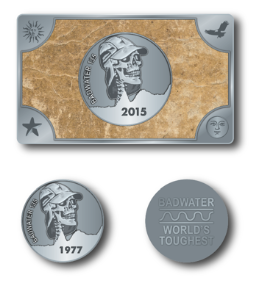 The result of these two new collaborators is depicted here: the 2015 Badwater 135 belt buckle design, as well as a commemorative coin we’ll have available this year which features the centerpiece of the new art, but references 1977, the year that Al Arnold made his original, ground-breaking, history-making run from Badwater to Mt. Whitney. We’ll post photos of both items in July, once the actual finished products are in hand. 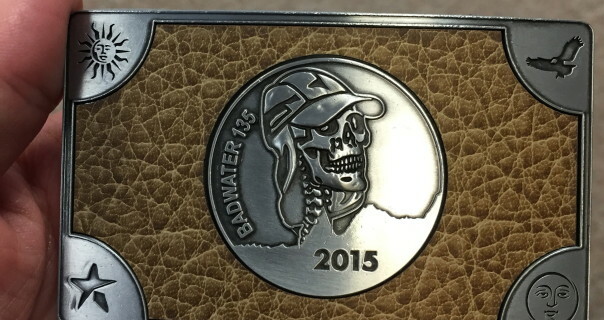 As always, the buckles will only be awarded to Official Finishers of the 2015 Badwater 135, while the coins will be available for sale to anyone at the race, and through the Badwater Store hosted by our friends (and Badwater 135 veterans) at Zombie Runner. 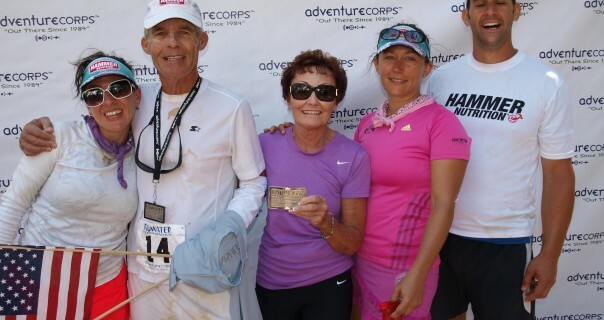 On March 21, 2015, AdventureCORPS, Inc. put on the BADWATER CAPE FEAR 50 Km and 51.4 Mile endurance runs, that were staged on Bald Head Island, NC, on approximately 10.5 miles of flat roads touring the southern sections of the island, 1.5 miles of narrow single track trail through a dense and scenic forest preserve, finally ending with 19 to 38 miles on sand from Cape Fear to Fort Fisher and return. The start line was at Old Baldy Lighthouse near the ferry terminal while the finish line was at Cape Fear. Adding in a few connecting sections the route covered 32 or 51.4 miles. A cut off time of 9 hours was in force for the 50 Km event, an intermediate cutoff of 8 hours at 50 Km and 14 hour overall cut off for the 51.4 mile race. There were three well stocked aid stations located at the finish line, one half-way between Cape Fear and Ft. Fisher and another at the turn-around located at the Ft. Fisher Ranger Station that kept the runners fueled and satiated with a wide variety of hot and cold food excellently prepared by the chef of Maritime Market. Also available and greatly appreciate were electrolytes, Hammer gels, sunscreen and minor first aid supplies. Drop bags could be left at Cape Fear and / or Ft. Fisher. The weather was ideal with a starting temperature in the low 50s, low 60s for a high temp and clearing skies after the early maritime layer burned off. The winds were generally light with a moderate afternoon sea breeze that connived to give me a headwind both out and back on the final Cape Fear to Ft. Fisher section. 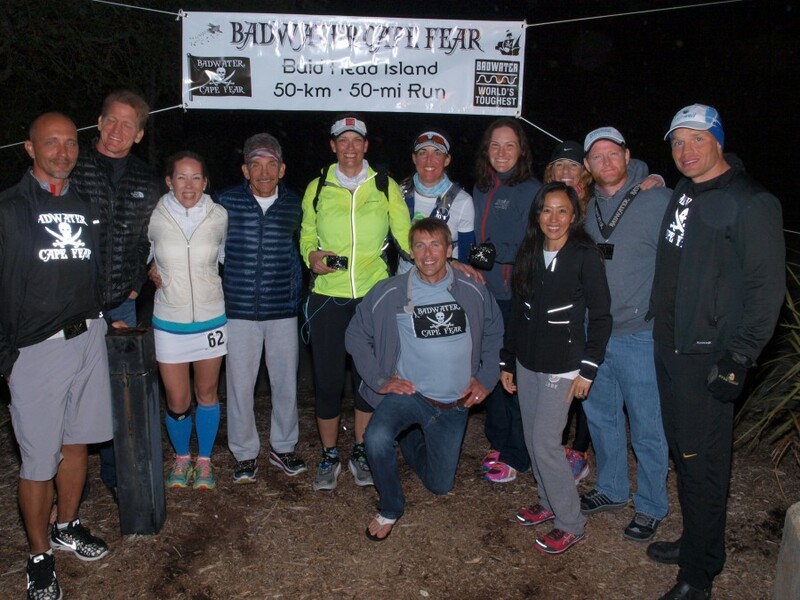 The social opportunities offered by BADWATER CAPE FEAR were important and very enjoyable as well. Most participants shared houses on the island to avoid the inconvenience and cost of multiple ferry rides from the mainland, so many new friendships were forged. The Facebook event page made it a relative simple process to locate roommates. The Friday night social mixer, hosted by Coastal Urge, was well attended and a lot of fun, an easy way to meet Facebook friends in person. Complimentary Natty Greene’s IPA and Ale were appreciated by many of the runners. After the hard Saturday on the sand was endured (pleasantly as the scenery was exquisite) the Sunday morning buffet breakfast was also a huge hit. Eggs, bacon, sausage, potatoes and coffee were plentiful and delicious. Indeed, after a 3-day weekend as provided by BADWATER CAPE FEAR, a painful reentry followed as one returned home to their own “real world” of responsibilities. Fortunately the memories last forever and planning commences for next year’s BADWATER CAPE FEAR to be held the weekend of 19th March 2016; registration is now open at Badwater.com. 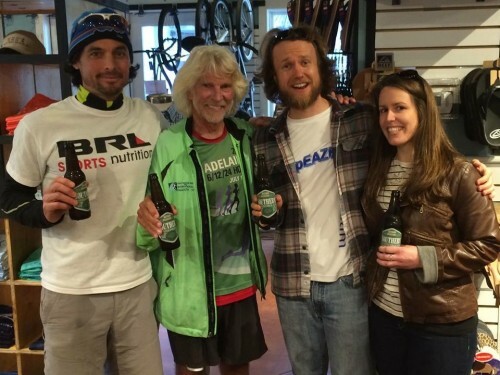 As most participants at BADWATER CAPE FEAR do, I shared housing with other runners to save on lodging costs, plus split the costs of groceries and craft beers. I have known Bradford Lombardi for a number of years, are great friends, shared lodging many times and know we are compatible. Using the BADWATER CAPE FEAR Facebook event page we tracked down our roommates Keith Hanson, Laura Mudge, Tim Finholm and Jenni Hollenbeck. Bradford and Keith both are sponsored by Skins, so they knew each other already. Myself, I only knew Bradford. We all exchanged social media handles and mobile phone numbers and agreed to meet Friday afternoon at our rental house, then attend race check-in and the Friday night social. I flew in a day early, stayed in Southport for convenience, and, after dropping off a Ft. Fisher drop bag at the Hampton Inn, I caught the ferry over to Bald Head Island. By chance, Keith and Laura were on the ferry, too, so we met up on arrival at Bald Head Island. Bradford was already at the house while Tim and Jenni were en route. By a stroke of luck, our original rental was occupied so we were transferred at no additional cost to a beachfront location! The views were stunning, the setting charming and, as we relaxed on the deck with a cold beer, I could feel what Bald Head Island was all about: Peace, Tranquility, Not a care in the world, except of course a 51.4 Mile run looming the next morning! Back Porch of our Bald Head Rental House. From Left: Bradford Lombardi, Jim Schroeder and Keith Hanson. Photo by Laura Mudge. After check-in, we all attended the Friday night social mixer graciously hosted by Jeoffrey Nathan, Co-owner of Coastal Urge. The IPAs and Ales were supplied by Natty Greene’s, one of 126 craft breweries in North Carolina. Being careful with our consumption, we chatted with friends a few hours, then made our way back in the dark to our rental house, not without incident as our electric cart battery died a mile short! Bradford jogged back to retrieve our spare cart and we were able to careful ease the dead battery cart back to the house, giggling all the way at our misfortune. Later we found that we only had a partial charge as the former tenants moved out a bit late. With the ultra-run looming, we all crashed early and slept soundly. Friday night social mixer hosted by Coastal Urge was a big hit with the runners, their friends and families. From left: Bradford Lombardi, Jim Schroeder, Keith Hanson and Laura Mudge. Arriving at the Old Baldy Start Line we all were very excited to get underway. The morning chill kept us moving at all times except for the numerous “photo ops” taking place. AdventureCORPS is known for its efficiency and rigorous adherence to a time schedule. Finally we were off for the initial 10.5 mile road segment! Frankly, I was worrying about the 39 mile segment on the sand, but I tried to relax and not start out too fast. Old Baldy Lighthouse Start Line. From left: Jim Schroeder, Norma Bastidas -Compayre, Meredith Dolhare, Bradford Lombardi, Frank McKinney, Keith Hanson, Breanna Cornell and Kelly Lavallee Facteau. Photo by Alix Shutello, CEO of Endurance Racing Magazine. I live along the Atlantic Ocean on a barrier island just off Melbourne, FL and run most every morning on the beach. This I assumed would give me a leg up in trying to better my age group competition against Bob “Badwater” Becker and others. I would be wrong. Bob and I see-sawed through the first 46 miles. As Bob said one time as he passed me yet again, “Like a bad penny, I keep coming back!” At the mile 45.77 Checkpoint 10, I was out of water and food so I needed to cross the deep sand and pull in for a refill. 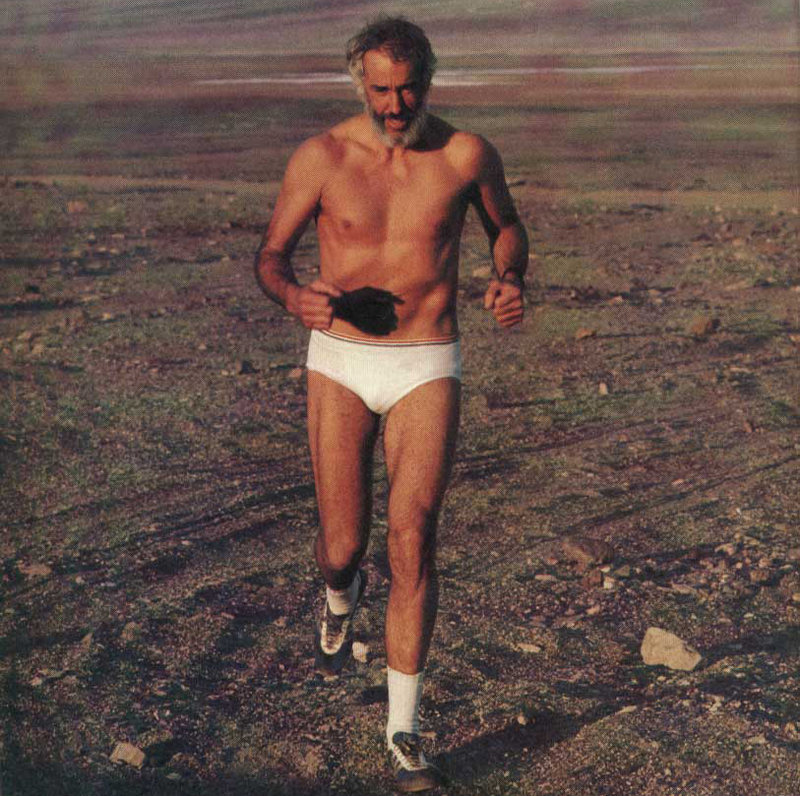 I turned around to say something to Bob only to see that he was still running on the firm sand bypassing CP 10 and appeared to be picking his pace up. I knew what he was up to of course, putting some distance on me, when he spied the opportunity! With just over 5 miles left I tried in vain to catch up, but I could not close the distance. Bob finished in 11:20 with me 9 minutes behind at 11:29. That was a lot of fun and Bob was waiting at the finish line, the first to congratulate me on my finish on a tough course. Also waiting for me, cold IPA in hand for my pleasure, were Bradford, Keith, Laura, Tim and Jenni! I could not have been more pleased! All my roommates turned in impressive performances as can be seen on the results link. Jim Schroeder Grinding it out on the Sands of Bald Head Island. Photo by Chris Kostman, AdventureCORPS Founder and Race Director. On the course I saw at least 14 or so friends from Florida who flew up together from the Ft. Lauderdale area. 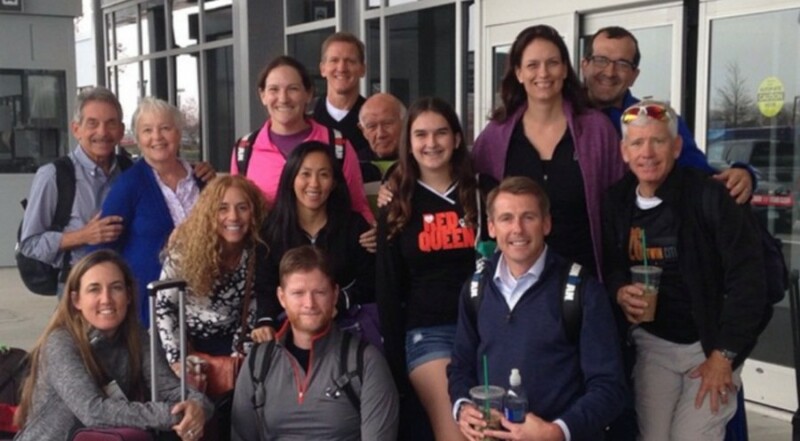 See Jodi Weiss’ excellent race report to savor all of their experiences! Naturally I saw numerous other ultra friends from around the US. As always, AdventureCORPS brings the family together and makes the reunion happen! BADWATER CAPE FEAR Finish Line. From left: Bradford Lombardi, Tim Finholm, Jim Schroeder, Jenni Hollenbeck and Keith Hanson. Photo by Chris Kostman, Adventure CORPS, Inc. I witnessed some very impressive running on the BADWATER CAPE FEAR course! The state of Wisconsin presented us with three top finishing runners in the 51.4 mile race. It must have been the relief from their record long cold winter that spurred them on! First Overall in the 50 Km was Michael Peragine, down from Carnegie, PA in 4:27, followed closely by Andres Fleury, Clinton, NC in Second Place with a 4:34 and Mark McGeough, Huntersville, NC posting a 4:38. First Female Addie Green, Port Saint Lucie, FL ran 4:54. Sarah McKeough, Huntersville, NC took Second Place Female with a 5:18 followed by Megan Maiser, Naples, FL running a 5:27. In the 51.4 Mile run, three runners vied all day for First Overall. Eventually Michael Borst of La Crosse, WI ran a blistering 6:29 for First Overall with Jacob Hegge of Onalaska, WI second with 6:37, then Pete Kostelnick of Lincoln, NB third in 6:38. First Female went to Suzanne Tulsey of Oak Harbor, NC, running a 7:56. April Anselmo of Hammond, WI took Second Place Female in 8:18, while Kelly Facteau of Siasconset, MA finished Third Female in 8:51. The results for all events can be viewed online here. Not surprisingly, Saturday night was quiet and we all retired early. We planned an early ferry after the Sunday breakfast buffet preparing to say our goodbyes. The weather was changing with rain forecast later that day. The ferry ride was scenic of course, but also rather special in a surprising way. The South Floridians remembered that it was Bradford’s birthday and organized a rousing version of “Happy Birthday” on the ferry. That would be the first time I’ve seen Bradford speechless! And blushing slightly. What a hoot. I expect Bob Becker was behind it all, but I cannot be sure. A hearty thank you goes to Chris Kostman, AdventureCORPS, Inc. 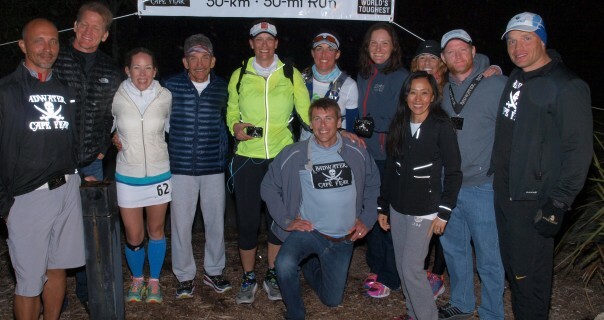 Founder, CEO, Chief Adventure Officer and Race Director, Laurie Streff Kostman, and all of the enthusiastic volunteers and ultra-runners, for a fantastic ultra- running experience. 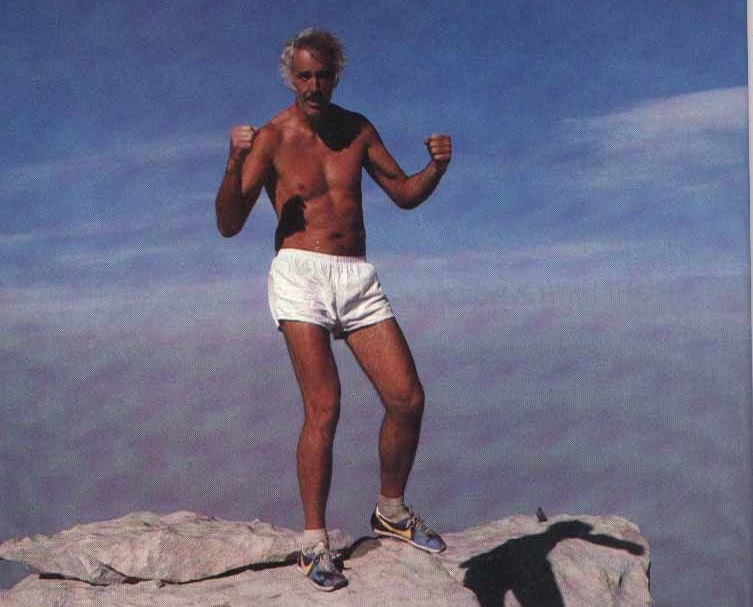 I will see many of you, my ultra running family, at the upcoming BADWATER events this year. 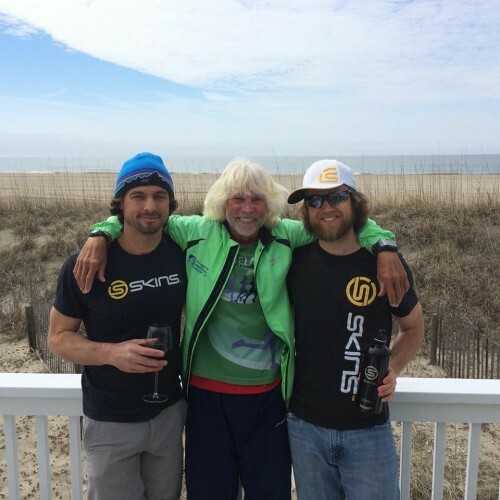 Badwater Cape Fear 2015: new location + beach = fun weekend! 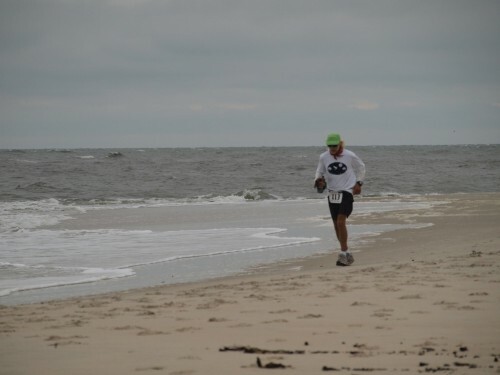 In 2014, I signed up for the inaugural Badwater Cape Fear 51.4 in the same manner I climb on board for any other ultra event: a new location + beach = fun weekend. I was in! 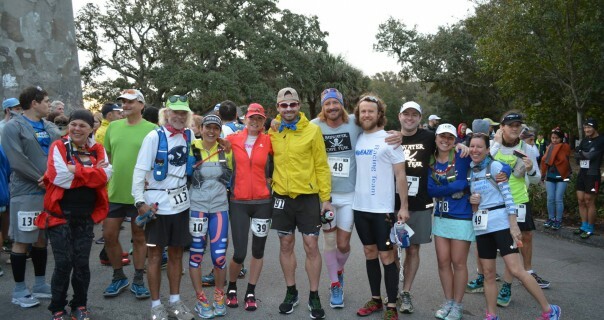 Soon the word was out amongst my Florida ultra buddies, and before we knew it we had gathered a group of 10+ runners and their families to share a house on the remote Bald Head Island in North Carolina. This turned out to be one of the funniest and most memorable race weekends of the year for our group – grammar lessons and kitty cat shenanigans and all – so when it was time to sign up for the 2015 race, it took all of about three hours for 14 of us to jump on board and opt to share a house, fly down together, and race! If you seek serenity, beauty, the chance to room with buddies in rustic, beachy mansions, and life with seriously limited internet/Wi-Fi for the weekend, Badwater Cape Fear is the perfect destination race. Add to that no cars – bikes or golf carts are the transportation mode on the island – and less than a handful of restaurants + one market, and you are truly in getaway heaven. There is a quaintness to the island that is reminiscent of New England charm, only a bit more down to earth. This year we rented the roomy Marsh Madness, which overlooked – you guessed it – a marsh, that Bob Becker noted would likely be mosquito heaven in the summer months. Within a few hours, MM became our home away from home, with each of us cozy on the living room couches, the fireplace blazing, magazines sprawled across the dining room table, and the kitchen humming with our famous chefs, not to mention enough food and treats tucked in our refrigerator and across our countertops to feed a small army versus a dozen runners. The best thing about sharing a house with buddies is that it alleviates pre-race jitters as we are all too busy discussing everything but the race to worry. After a pleasant day of lounging around the island, it was time to lace up our running shoes and get moving! The race commences at Old Baldy Lighthouse, and continues along the winding roads of Bald Head Island, weaving in and out of alleys and paths filled with sprawling mansions and picturesque beach landscapes. A tad over 10 miles, just when you start to feel super at ease and comfortable with your gait, you enter the enchanted tangle of North Carolina trail, which requires you to maneuver tree branches overhead, roots and tree stumps below, and the occasional log and other trail debris to stumble over. And yet, the trail is a magical element of the race. For 1.4 miles you are immersed in a faraway world that forces you to focus, navigate, and utilize your obstacle-course skills. Just when you get comfortable in the trail’s shade, you are back on the road, making your way towards the beach: Endless stretches of majestic, solitude-ridden beach. The waves crashing the shore and drifting out to sea. Birds coming in for a landing and flocks of baby birds scattering the shore like school children out to play. This year the high tide coincided with the mass of us runners hitting the beach, along with a fierce wind that permeated your ears and chest, so that each step forward was a bit of a struggle, until you acclimated, and were absorbed by the ocean’s mesmerizing crash and retreat. For me, the 39 or so miles on the beach stretch is a time to think and not to think. A time to push and a time to be pulled. An opportunity to be alone in your own mind, which is something that we so rarely achieve in our everyday on-the-go lives. I am a believer that monotony forces us to go inside, to a place where the possibility of change and growth resides – a place where our true magic is born. The first 30 or so miles I was more silent than not, which is untypical for chatty me. But I was afraid that if I spoke, I would break down and all sorts of “I can’t do this; it’s too hard; I don’t have it in me” would come out of me. I was scared I would talk myself out of the possibility of success. And so I let silence take over. I let the rhythm of my feet guide me. I listened to my breath. I followed my running partner and moved and breathed and tried not to project ahead. I tied my goals to arriving at one aid station after another. In an ultra-race, there are so many little mini triumphs: hitting the halfway mark, the 50K mark, then knowing that it is only one more stretch of 10 miles separating you from all the things you want to enjoy in life when the race is over! Beyond the running, beyond the struggles, and the triumphs – PR’s and 1st-time ultra finishes – one of the most fulfilling aspects of running ultras for me is the camaraderie on the course. 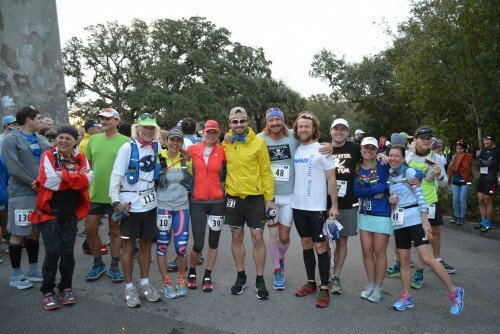 At Badwater Cape Fear, you get to run amongst 100+ of your old and new friends, cheering one another on and offering accolades along the way – “you got this,” to “almost done,” to “great jobs” abound. Crossing the finish line is a perk, but it is by no means the reward. For me, when it comes to ultra races, what I gain is deeply internal and personal and something that is in no way tied to a finish time or performance: I get that much closer to accepting and understanding elements of myself. But a race is about so much more than a race. It is about friendship. It is about the day before the race traveling via planes, shuttles, ferries, and trams to arrive at your race-weekend digs. It is about sitting around on couches in a rented mansion and sharing stories and laughter. It is about fun and games and taking a time out from our everyday lives. It is about setting the long dining room table for the pre-race house dinner, and the morning-of-the race 5 am foot-taping party. It is about waiting at that finish line to cheer in each and every runner friend, and sharing a glass of wine or beer when the race is over. It is about the following day, when a bit broken, a bit more put together, you all attend the post-race group breakfast, and then catch the ferry to journey home together, to your own little lives and back into worlds that are not about races, not about finish lines, not about medals and buckles, but about memories and friendships that last throughout the year. 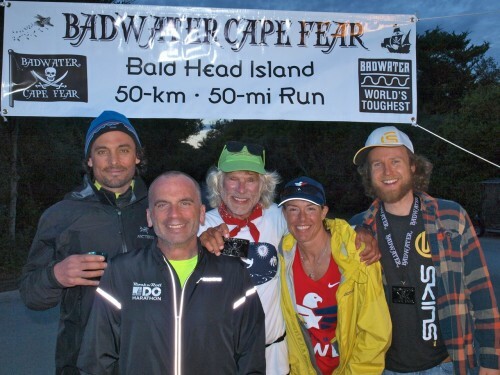 It is about not hesitating for one moment when it’s time to sign up for the 2016 edition of Badwater Cape Fear – and immediately starting the dialogue about which house you want to rent on the island come next year.